Contrary to what many detox websites indicate, aluminum is not one of the heavy metals. In fact, its lightweight feature is what makes it so pervasive in our culture. Although it’s a little known fact, aluminum is widely used to treat municipal and even bottled water supplies, so it occasionally manages to slip into the tapwater you drink at home. Equally unsettling, aluminum compounds are routinely added to popular deodorants, antacids, vaccines and medications. And there’s more bad news. Aluminum additives now flood the shelves of supermarkets and restaurant stock rooms throughout the industrial world.. From baking mixes to table salt, this metal lurks inside almost every go-to food in our diet and even our dining out choices. Even nutritional supplements purchased to detox aluminum from the body are packed in aluminum. How, you ask, is this even possible for a known neurotoxin, one suspected as a contributing factor to diseases like Alzheimer’s and Autism? For reasons that remain unclear, the Food & Drug Administration classifies aluminum under the peculiar heading of GRAS – “Generally Regarded As Safe”. This waives manufacturers of the requirement to conduct toxicological testing to prove an additive or packaging material is safe. Product chemists routinely combine aluminum with other elements in the periodic table – like sodium, sulphur and phosphorous – to generate additives to prevent odors, keep powders dry, preserve vaccines and bleach flour. One particularly prevalent compound now found in higher than normal concentrations in soil, air and water sampling (along with the human bloodstream) is aluminum oxide. As it is a key ingredient in the aerosols sprayed across the sky daily in at least two dozen countries, independent investigators and property owners alike have petitioned government authorities in Arizona and California (and New Zealand) to take remedial action that would stop the sprayings. To date, local and state agencies have failed to respond or publicly disclose the results of any official tests that may have been undertaken. See the Watch Videos page for more on this subject. Of course, aluminum oxide is a common material used in construction and fabrication. When initially produced (or later grinded), the metal is pure. But after making contact with the air, an oxide develops on any bare aluminum surface. This is similar to rust (i.e. iron oxide) forming on steel. In the case of aluminum, the oxide develops far more quickly and is relatively transparent. Because of its characteristic hardness, aluminum oxide is the abrasive used on nearly all sandpaper and grinding wheel products. Significantly, whenever aluminum oxide particles become airborne, an occupational safety hazard exists. Inside the lungs or sinuses, these particles can cause respiratory illness and infections. That’s why industrial shops are required to run overhead ventilating systems to vacuum up the dust. In addition, workers must wear NIOSH-approved particulate masks or respirators whenever portable or pneumatic sanding/grinding equipment is operated. 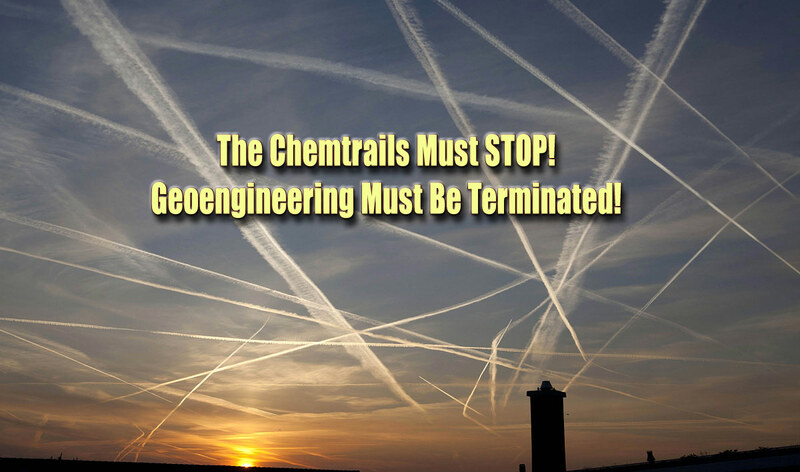 To create chemtrails, a liquid spray of aluminum is dispensed into the air by specially outfitted aircraft, according to patents and explanations of the technology provided by geoengineers. Once it contacts the air, the particles transform into aluminum oxide. Other metals may be mixed with the aluminum in smaller amounts, especially barium, which provides the white color of the artificial clouds that eventually form. Unfortunately, the particles dispersed in chemtrails are a lot smaller than the ones on sandpaper, so you can’t see them when they scatter and fall to earth. These submicron or nano-sized toxins are easily absorbed into the cells of biological organisms, including humans. The particles may also coat plants and tree leaves, penetrate root systems and provide an accelerant for wildfires to spread a mile or more in just a few minutes. Besides the soil, aluminum oxide accumulates in the snow pack and bodies of water. These drinking sources should be avoided by hikers and those who live or work around them. According to most health care experts, the risk posed by metal contaminants inside the body is generally low when exposure is minimal, but high when taking place over an extended period of time. The metal can damage the nervous system and the brain, or harden as plaque inside the arteries. Significantly, a direct pathway to the frontal lobe of the cerebral cortex becomes available when aluminum oxide particulates are inhaled into the sinus cavities. Rational thought and short-term memory are both affected by this region of the brain. From the bloodstream, aluminum is likewise able to cross the blood-brain barrier, a system of smaller blood vessels designed to filter and keep out foreign substances. Studies of Alzheimer’s patients conducted post-mortem have not infrequently found aluminum or some other metal (copper, zinc, etc.) lodged in the brain in high amounts. It’s generally assumed that the source of this contamination involves foods, drinking water, medications or consumer products. So there is as yet no smoking gun to tie aerosol sprayings to aluminum toxicity.